1993. While the Dallas Cowboys were winning the Super Bowl, the California Milk Processor Board’s ad agency was coming up with “got milk?” and Jurassic Park and Mrs, Doubtfire were dominating the box office, Dan Dinsmore had big plans. With Pearl Jam, Alice in Chains and Nirvana playing in the background, he was getting to work making his biggest dream a reality. What began as a one-man operation surviving on a pile of maxed-out credit cards and Dan’s connections to the music and entertainment industry has since grown into a nationally recognized, award-winning creative agency. With the help of his talented team and loving wife, Michelle, the company has grown tremendously, and this week, we are all excited to celebrate Overit’s 20 years of redefining creative marketing in the Capital Region and beyond. Ready for this flashback? 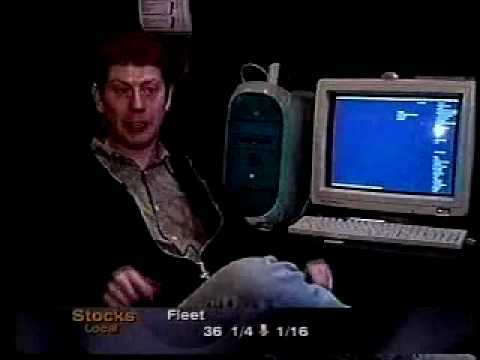 Check out Dan in this interview with the local CBS station back in the late 1990s discussing his goals for Overit’s future growth. When Dan set out on this journey, he had high hopes for Overit’s ability to create cutting-edge technologies for the media industry and expand its scope to reach both national and international markets. And most of all, he wanted to accomplish all of this from his home in the Capital Region. Over the years Overit has expanded its size, services and headquarters, and we’ve found our home at St. Theresa’s Church on New Scotland Ave. As we celebrate two decades of dedication and hard work that have resulted in meeting – and often exceeding – his goals, Dan reflects on some of the challenges he faced and lessons he learned along the way. Stay true to your vision and be passionate about what you do. Never sacrifice quality for anything. Surround yourself with talented people whose strengths lie in your areas of weakness. Empower your team. Recognize and award hard work and innovative ideas. Don’t be afraid to push boundaries and explore new methods. You can’t be everything to everyone. Know your value and never underestimate yourself. In order to properly celebrate this accomplishment, we look forward to sharing tomorrow evening with people who have supported Overit the most: our employees, friends and family. We’ve put our own spin on Germany’s popular beer festival where guests will enjoy a variety of seasonal beverages, light hors d’oeuvres and the company of those who have graciously contributed to Overit’s success. Our event’s name? We will cheers to 20 years of truly pushing the boundaries of creativity and to what the next 20 years have in store for this talented team! Wait – There’s More to Celebrate! As we recognize our 20th anniversary, we’re also celebrating a new event in Overit’s history. We’re proud to share that our team won the award for “Best Integrated Campaign” last night at the 2013 US Search Awards! Our KnowTheOdds campaign with the New York Council on Problem Gambling was named the top campaign of seven great shortlisted nominees. We’d also like to congratulate Mannix Marketing, Inc. for winning the award for “Best Use of Search – Retail” for its work with Atlantic British and the RoverParts.com website. The recognition of Capital Region marketing companies was tremendous in Las Vegas last night, and we’re thrilled to see our area recognized on this national stage. You can view a complete list of 2013 US Search Awards winners here. Thank you for your support, everyone! Great post, Sarah. Love all the references to 1993. That video of Dan is so classic. Ohhh man, that news clip from ’93 is absolutely priceless. This is just so cool to see how far the company has gone under Dan & Michelle’s direction over the years. I’m so pumped for Oktoveritfest – it will be an absolute blast.